I finally got around to doing a little more painting. I took a few Fridays off of work in December and got out my paint brushes. 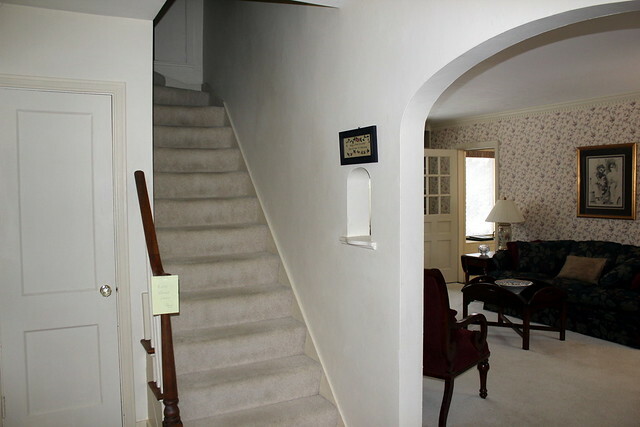 I still never finished the trim in the living room, but instead decided to tackle the entry way/upstairs hall. I spend a good deal of time on the living room couch, either reading or doing homework :(. 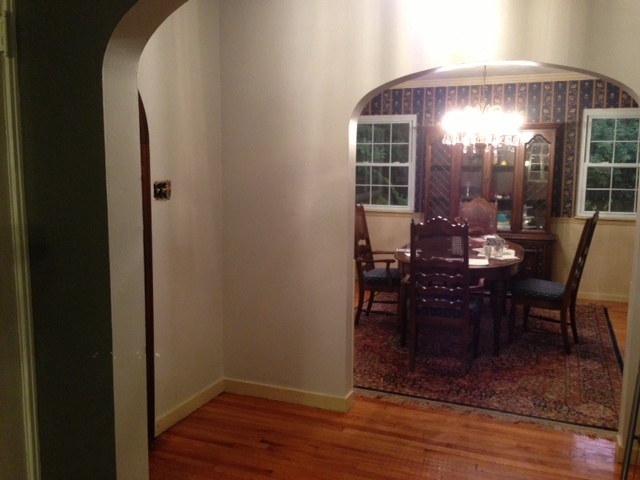 From the couch, my view was into the entryway/dining room. And the cream color of the entry just drove me insane. These pictures do not do it justice how dingy and dirty and gross it looked. Everything was just varying shades of off white. When the entry light was on, everything just looked very yellow. 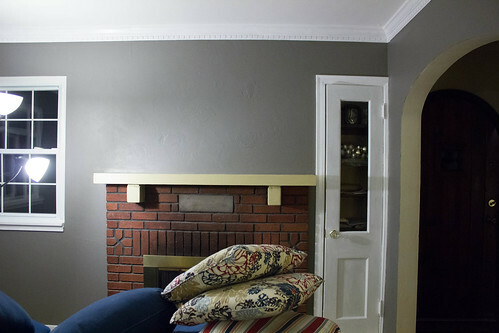 I figured I could paint those walls, then when it was time to paint that trim, I could do the living room trim also and it would be one big happy project. 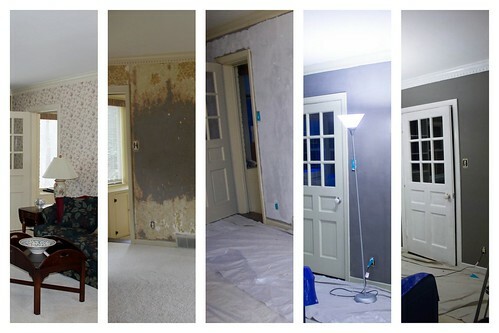 It took me 2 days to paint, it wasn’t a lot of wall but it was a lot of cutting in. 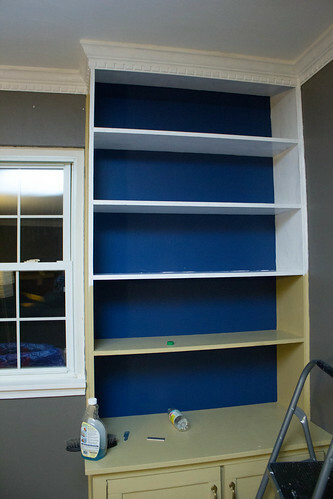 I also ran out of paint at the end of day 1. 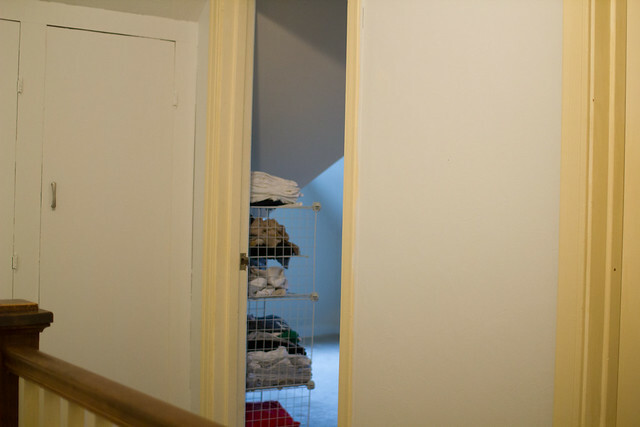 Annnd I couldn’t reach over the stairs, so I had to buy an extension pole. The first day that I was painting, my cousin Kirk came up and replaced some of my light switches/electrical outlets for me, which helps SO MUCH. My livingroom had been switchplate-less for almost a year because I refused to put new plates over grimey switches. On one hand, it looks so much better, on the other hand it looks TERRIBLE with all the yellow-y trim, haha. 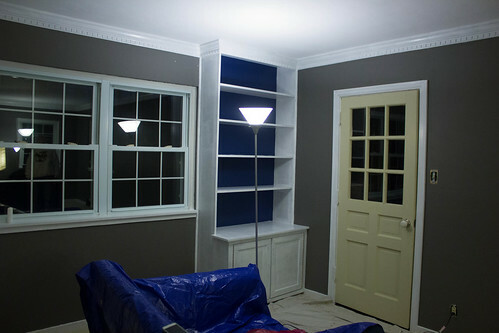 The color is Behr-Sterling and it’s a very light grey but it reads almost blue in some lights. 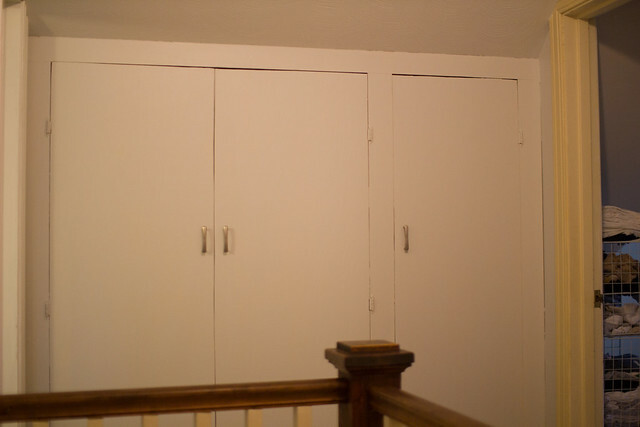 I also replaced the handles on the hall closets, they previously had weird white handles with chickens on them. 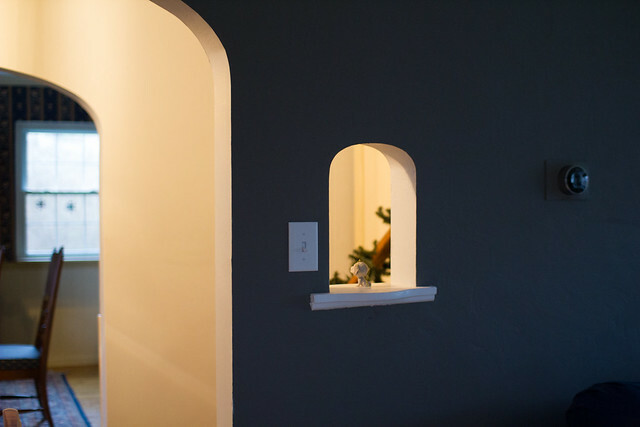 In the second-to-last picture, you can see that the entry still has a bit of a yellow cast, I want to replace the light fixtures and when I do I can hopefully get some bulbs that read cooler. Definitely going with a moravian star for the entry. You can’t see both lights at once no matter where you are, so I thought something dramatic for over the stairs would be fun. We’ll see! I still have two giant bookcases, 9 doors, a few windows, and a whole bunch of baseboards before I can start thinking about lighting. And then I can start on the dining room and rid our house of the last bit of wallpaper. SO EXCITED. 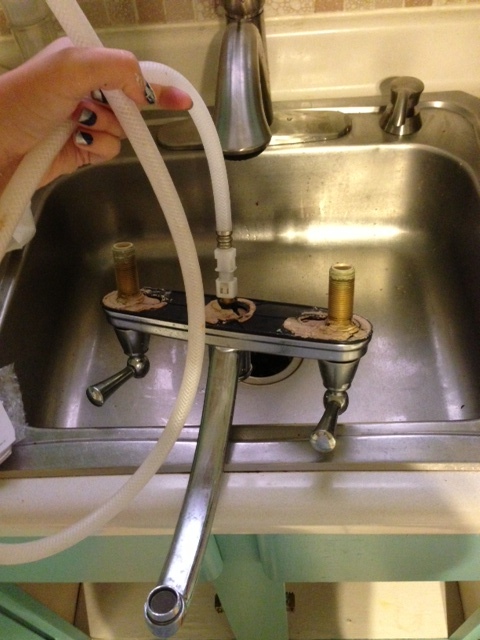 while the cat’s away, the mouse will play (with plumbing). I hope you enjoyed your extended weekend (if you got one)! It wasn’t until a few years ago that I started getting these glorious holidays off and I try not to take them for granted. I was pretty busy the rest of the weekend so I had fully intended on doing nothing on Monday. 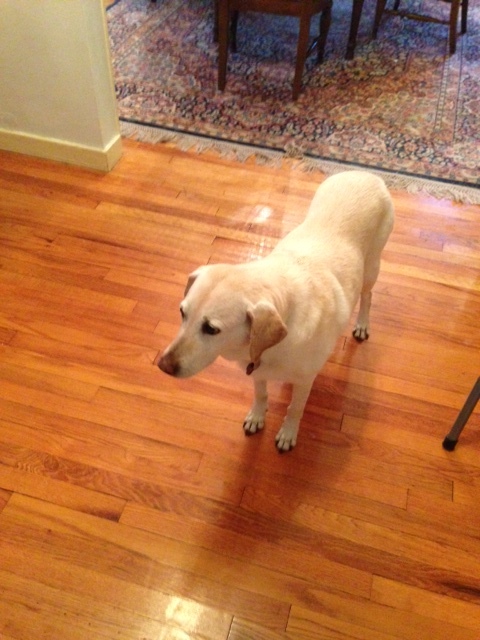 Saturday we took Daisy to the vet for her annual checkup. Babygirl is looking good, down .1 lb from last year! We were a bit early for her appointment so I went into Target to kill time and walked out having only spent $10. Pretty sure my last 3 Target trips were all record breakingly low, as in under $20. I’m not sure what is happening to me. Saturday afternoon I headed to my little cousin Adam’s birthday party while Keith went to a baseball game. Always nice to see the family! It also may have been the only family function in the past few years that I did not bake cupcakes for and they were sorely missed. Sorry fam! 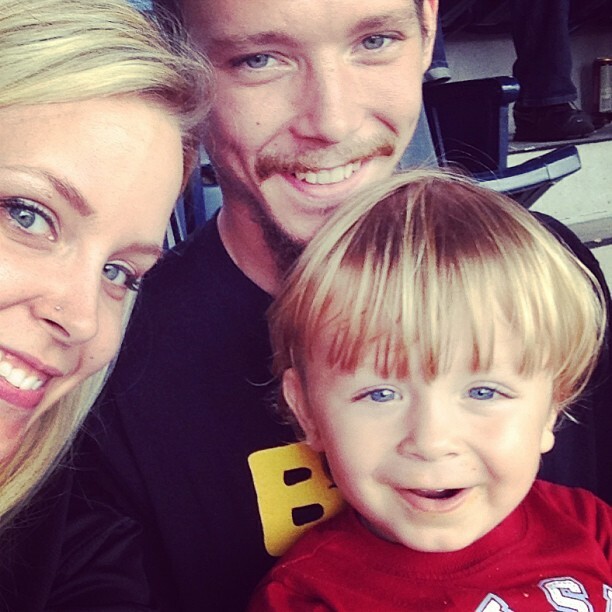 Sunday we headed to the ballpark where we met up with my stepdad, my brother and my nephew. It was Bradley’s first baseball game! He did great, they stuck around until the 7th inning or so, too bad the game was so terrible. Bradley is 18 months old now and seriously the smartest. I asked him where Uncle Keith was and without any hesitation, he pointed right at him! Love that little fella. Sunday night we went to Keith’s parent’s house for dinner and that was nice. 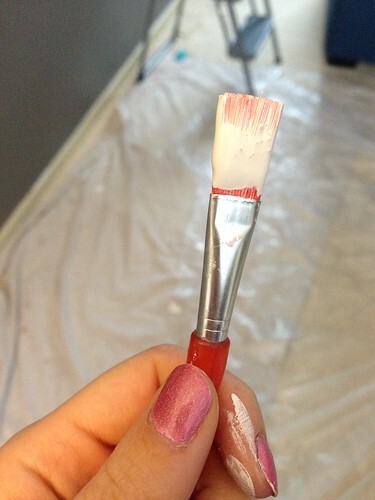 While there, his mom was asking my opinion on painting her basement and I decided I needed to squeeze some painting in ASAP. 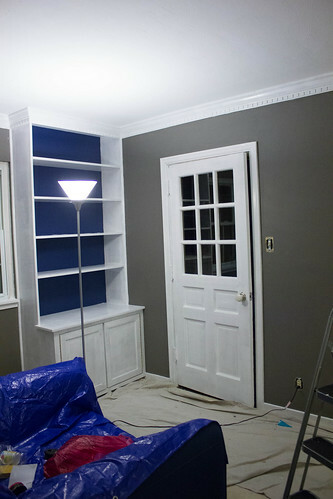 My livingroom trim has been half done since January and it’s a lot of annoying door/window painting that I just don’t feel like doing. I had decided I wasn’t allowed to do anything else without doing that first, so then I just wasn’t doing anything. Well when I woke up Monday, I decided it was the day. I first stopped at Lowe’s for some other project supplies. A few weeks ago, I used the bathroom in the middle of the night and when I flushed the toilet, water started pouring out of the tank. I pulled the lid off and water was spraying everywhere. I reattached the hose from where it had popped off and went to bed. The next morning, same thing happened. I called my sister since her boyfriend is a plumber and she told me to lower the water pressure. So I did and everything was fine for a few days until it did it again. I lowered the water pressure even more and it’s been that way for a few weeks. The water pressure was so low it was taking upwards of 30 minutes to fill the tank. Not an emergency, but really freaking annoying. So, I watched a few videos online and figured I could handle it. 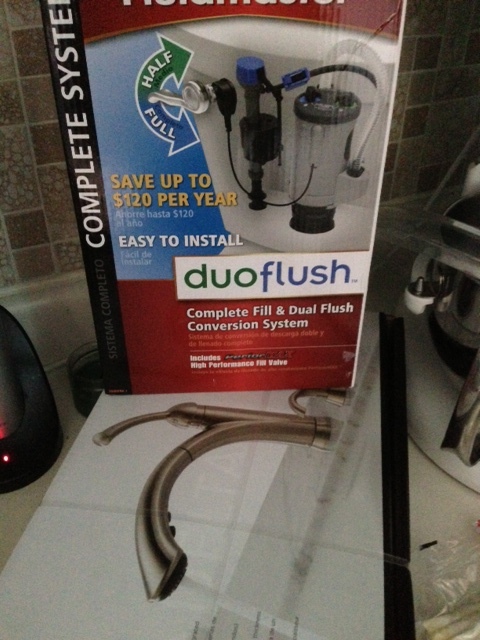 While grabbing the toilet guts, I decided to be fancy and get one of those dual flush systems. Got home and sneakily went to work while Keith was downstairs watching tv. I was about 80% through the installation when I realized the fancy system would not fit. I had to pack it all up and take it back. And admit to Keith that my attempt failed. He just rolled his eyes. Got back to Lowe’s, grabbed a regular fill valve and had a working toilet in about 30 minutes! I was very proud of myself. I think I need to fuss with it a little more because it has a leak guard and that is doing some weird things, but it works! 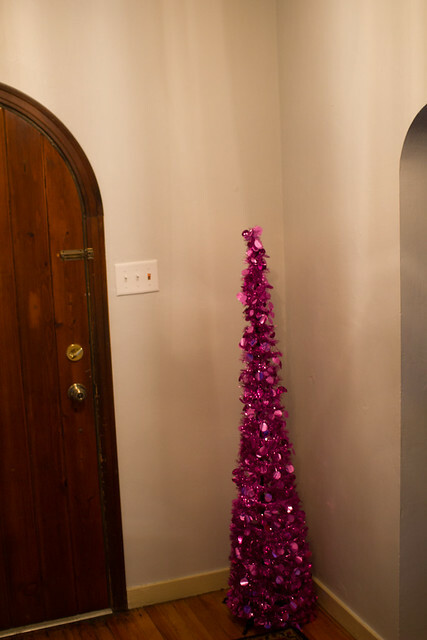 After that, Keith was getting ready to go to the football game and I decided I was going to paint the entryway. 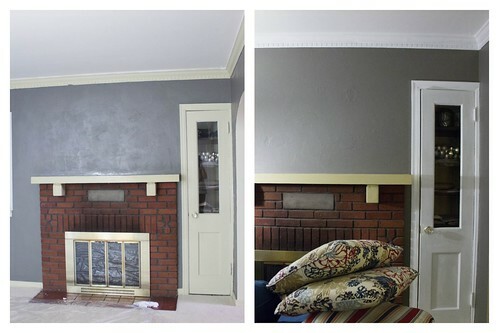 I figured it would motivate me to get the trim paint out and then I could finish the living room. 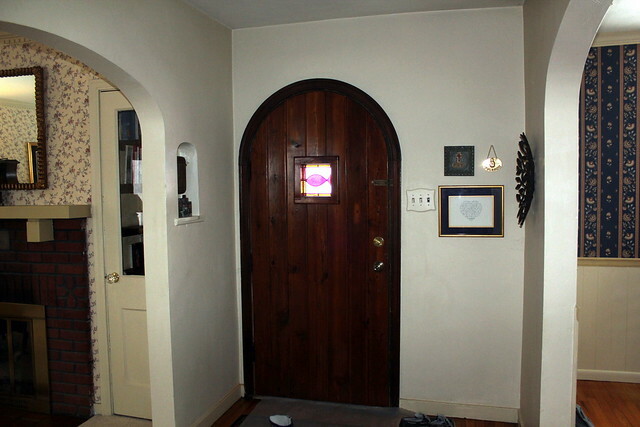 Here’s a shot of the entry from when we looked at the house. Off-white walls with beige trim. The tone on tone off-white just made everything look so grimy. Here’s a more color accurate view. Pardon the mess. 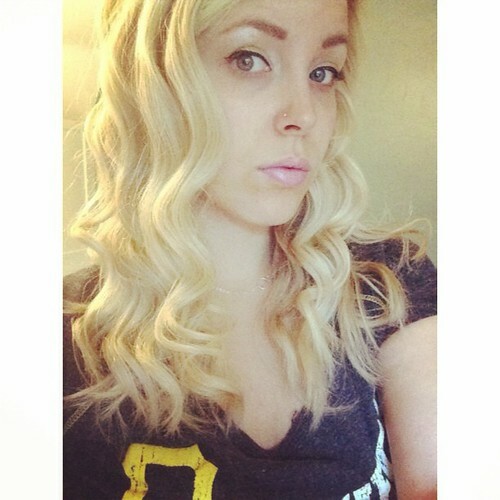 It just looked yellowy. And gross. 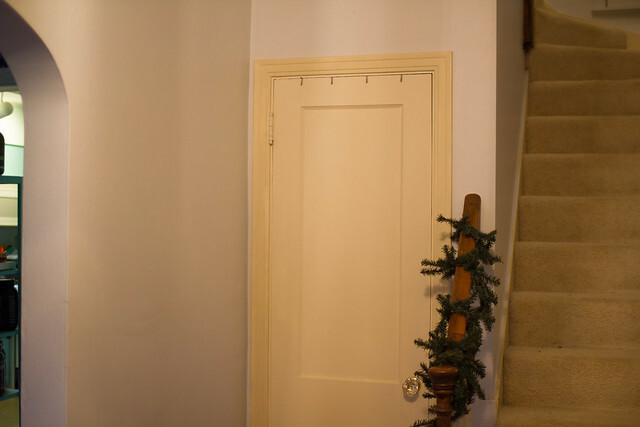 I did half of the entry, I didn’t want to start up the stairs yet, so it stops pretty abruptly on one wall, and the little back hallway. It’s a very anticlimactic after, because it was getting dark by then. 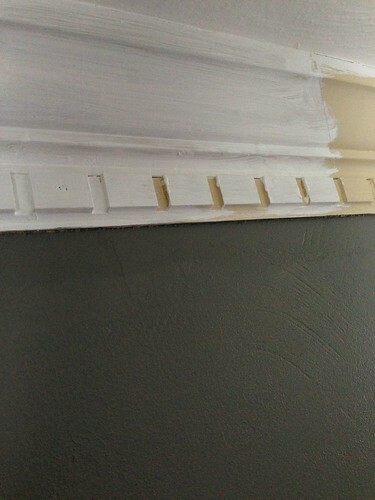 I also didn’t paint the trim, so most people probably can’t even tell I painted. 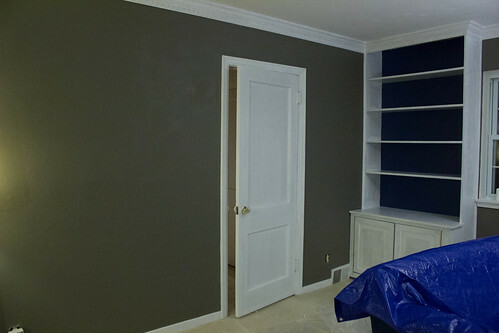 The color is Behr – Sterling. A nice, light grey. 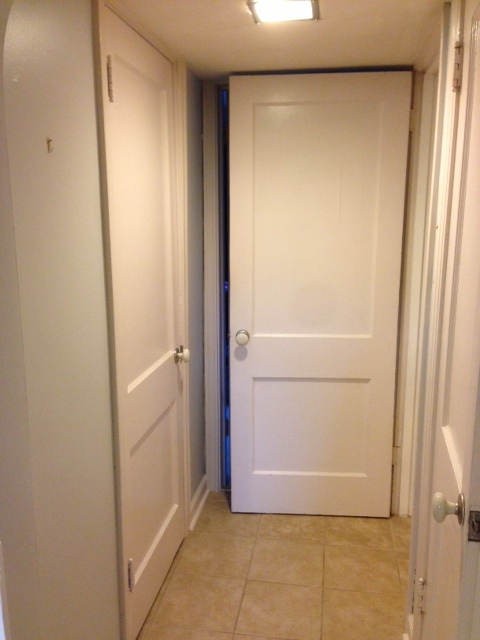 It’s even less noticeable in the back hallway since the four doors in the hallway are gross off-white as well. Once I get my bright bright white trim, it will look awesome. 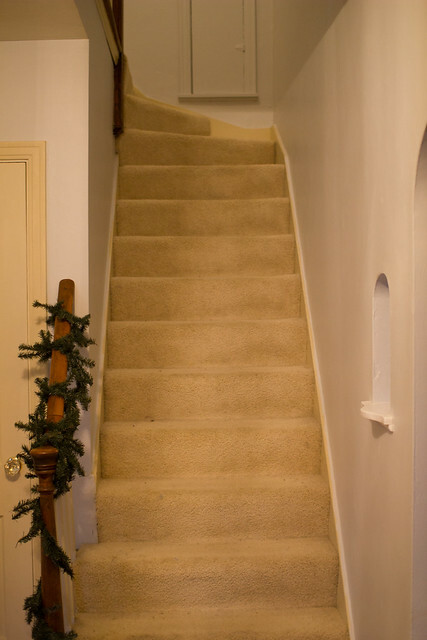 I rolled up the entryway rug to paint and I think I like it a lot better without it there. It is a dark oriental rug and so big it covers most of the floor. Thinking of leaving it off entirely or maybe getting a smaller rug, it really opens the space up without it. We don’t use the front door anymore, so it’s not like people need to wipe their feet. 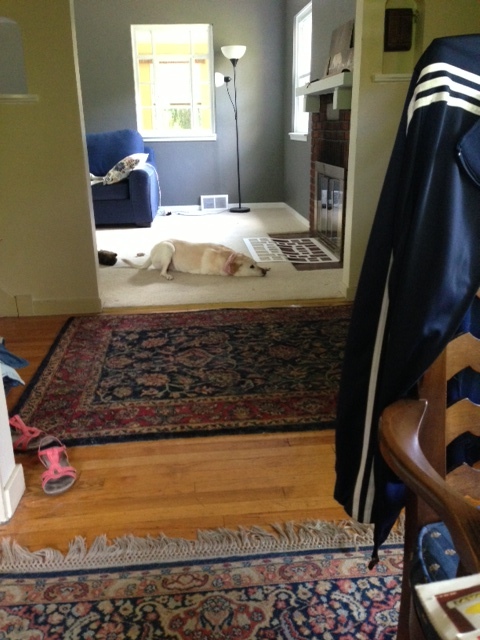 Also dreaming of refinishing the floors. I saw a picture of someone’s floors after they were sanded down but before they were stained and loooooved the look of the blonde wood. Thinking of something like that way down the line. 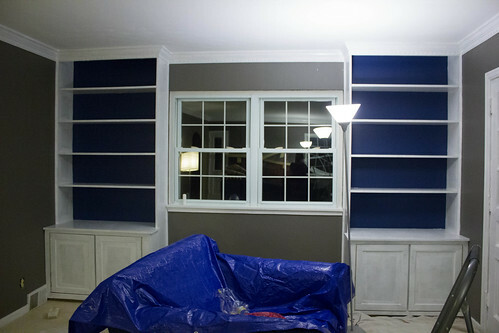 After I got one coat up I had one more project to complete before I called it a night. I wouldn’t say this was a nightmare, but it was not fun. I don’t know if you’ve spent any time under a sink, but it’s pretty close quarters under there. Add in a gigantic garbage disposal and it’s even less fun. Luckily (?) the reason I was replacing the sink was that the plastic nuts had all completely broken off, so removing the old faucet was super easy. 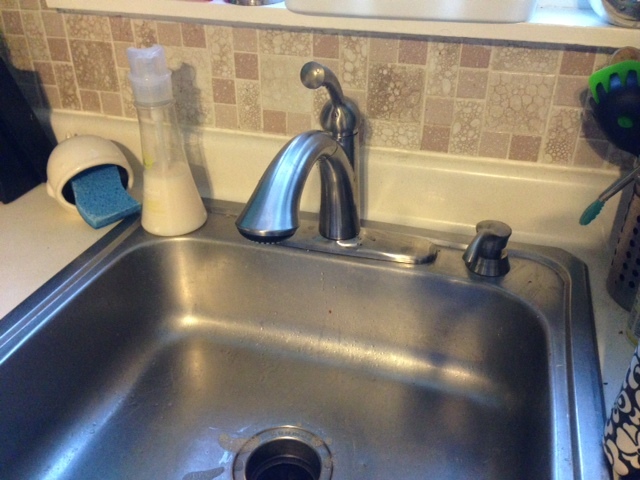 I would have had an easier time installing if either the garbage disposal was not there or my arms were 3 inches longer, but I am stubborn and wanted to do it by myself. I was super proud when I stepped back and it was all finished and there were no leaks and I tested it and the hot was cold and the cold was hot. Ugggggggggggh. So I had to unhook those and redo them. That was honestly the hardest part. I have blisters on my fingers today from tightening those stupid nuts. But she’s a beaut! Delta – Lewiston with a pullout sprayer and fancy soap pump. I wanted one of those Touch20 faucets but they are like $400. No thanks. I’m dreaming of non-laminate counters and an undermount sink but that will be wayyy down the line. The plus side is my faucet can come along for the ride.